UK police have confirmed that four people have died as a result of Wednesday’s attack and 40 people have been injured. A/Dep Cmsr Rowley: "At this stage - but it may change - we believe approx 40 people were injured including three police officers." Police have also named the officer who died as 48-year-old husband and father PC Keith Palmer, a 15-year veteran of the force. A/Dep Cmsr Rowley: "One of those who died was a police officer from our Parliamenary & Diplomatic Protection Command who had 15 yrs service"
Several others have "catastrophic" injuries after a car reportedly mounted the pavement on Westminster Bridge and "tried to mow people down"
Five people have died, including one woman, the alleged attacker and a police officer. Many others obtained "catastrophic" injuries, St Thomas' Hospital junior doctor Colleen Anderson told reporters. “There were people across the bridge. There were some with minor injuries, some catastrophic. Some had injuries they could walk away from or who have life-changing injuries," Anderson said. Mark Rowley, assistant commissioner of the Metropolitan Police, said the police are "satisfied at this stage it looks like there was only one attacker." An eyewitness has told Sky News he saw a body "face down" in the Thames. Witnesses said people either jumped or were knocked over the side of the bridge as the car mounted the pavement and struck a number of pedestrians. A spokesman for the Port of London Authority, which looks after safety on the river, said a female member of the public had been recovered from the water near Westminster bridge after she "fell" or "jumped" in. "A female member of the public was recovered alive from the water, but with serious injuries. She has been brought ashore and is undergoing urgent medical treatment. The working assumption is that she fell or jumped from the bridge." Shocking videos and photographs show people lying on the bridge, bleeding heavily, with members of the public rushing to their aid. An eyewitness, Richard Tice, described what he saw to RT. “I came out of Westminster Tube at about 2:45pm when police were locking down the tube, ushering people out away from Parliament. I was ushered onto Westminster Bridge, and then I looked across the bridge, onto the west pavement,” he recalled. Another witness described seeing a middle-aged man carrying a knife running towards the Palace of Westminster. Kamal Alam, a Syrian military analyst whose office isn’t far from where the attack took place, also spoke with RT. “I thought it’s just some kind of school drill, but within a few seconds heard what sounded like gunshots and a lot of screaming, and all of a sudden there [were] dozens of armed policemen telling everyone to run away from Parliament Square and Westminster Tube Station,” he said. Jayne Wilkinson told Sky News: "We were taking photos of Big Ben and we saw all the people running towards us, and then there was an Asian guy in about his 40s carrying a knife about seven or eight inches long. "He had a lightweight jacket on, dark trousers and a shirt. "He was running through those gates, towards parliament, and the police were chasing him." 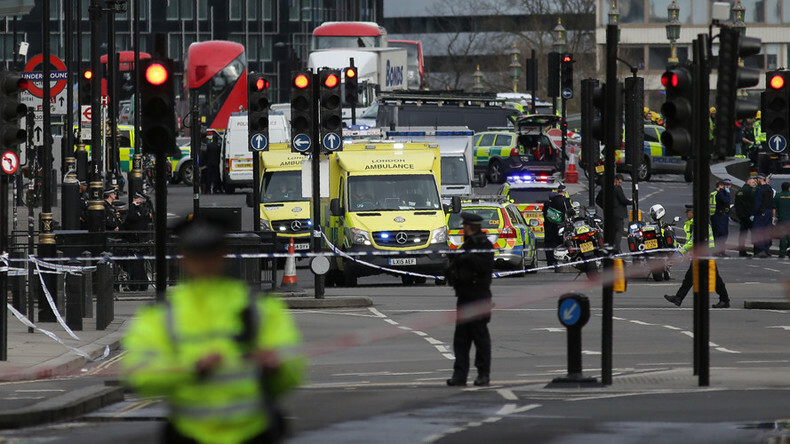 According to Doug Weeks, terrorism expert at London Metropolitan University, the attack, while softened by the high security presence in the area, could have been far bloodier. “Well certainly within the Parliament compound itself, that is by far one of the most secure areas within London. There are numerous police officers and other security personnel that work in that area as well as around that area, thus it’s not surprising that the police have a very rapid response to this incident,” Weeks told RT. Following the attack, Number 10 said Prime Minister Theresa May was safe. The spokesman declined to say where May was when the attack took place. It is understood, however, she was rushed to a car 40 yards from the gates outside parliament where the shots were fired minutes after the attack. She was ushered by at least eight armed undercover police, some with their firearms drawn. The leader of the House of Commons David Lidington said the alleged assailant was shot by armed police "inside the parliament perimeter." Parliament and the surrounding area were placed on lockdown. Staff inside parliament were told to stay inside their offices. The London Eye was stopped and temporarily held all its "guests" within the attraction. An air ambulance landed in Parliament Square shortly after the incident. London Ambulance Service deputy director of operations Pauline Cranmer said it has "declared a major incident and our priority is to assess patients and ensure that they are treated and taken to hospital as soon as possible." The US State Department said it was closely following the "concerning situation" in the UK. "The Department of Homeland Security stands in solidarity alongside our friends in the United Kingdom in condemning the terrible attack at Parliament today. With our partners in federal law enforcement, we are in close contact with our British counterparts to monitor the tragic events and to support the ongoing investigation," it said in a statement. The Muslim Council of Britain has issued a statement on the attack, which has not yet been claimed by any group. It has been one year today since the terror attack in Brussels.